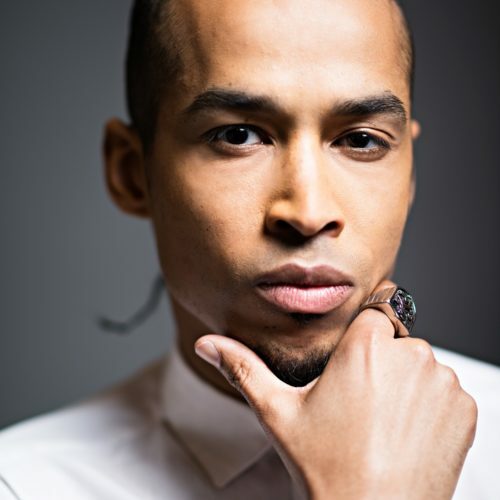 Sir the Baptist, Hip Hop’s Chaplain, is an internationally known recording artist signed to Atlantic Records, BET Award nominated and co-signed by Forbes, CNN, BBC Radio, NPR, The Grammys, Sway, Billboard (“Heaven” reaching Top 20 on the Billboard Charts) and more. It’s Sir’s electric live performances, clever wordplay & trailblazing cause of “Healing Hip Hop” that sparks the interest of many at first, but that is only a few of the key elements that make Sir a force to be reckoned with. Jay Z and Stevie Wonder are just two of the Urban Monks who have co-signed Sir in this cause. As a second generation cultural minister, growing up in historically rich Bronzeville neighborhood in Chicago, Sir uses the power of hip hop’s influence to tell compelling stories about real people to strip away the shame and embarrassment created by institutional stigmas that negatively effect so many communities, including Women, LGBTQ and religious people around the world. It’s from his own life experiences that he draws the most inspiration, but he also uses his music as a vessel to tell the story of others, in hopes that his music will serve as a holistic soundtrack for life — blending spirituality and the streets. Sir began to take music seriously once he joined Leo Burnett, one of the largest advertising agency in the world, scoring music and running digital marketing campaigns. While this got his foot in the door, it was taking up too much of his time to commit to his artistry. This forced Sir to quit working at Leo Burnett, to sleep out of his car and drive for Lyft. It was in his Lyft car in Chicago that Sir wrote and recorded his first hit single “Raise Hell”, which hit #1 on Spotify’s Viral 50 and has over 6 million streams to-date. Sir the Baptist delivered his first full form statement in his debut album, Saint or Sinner. Sir isn’t just a recording artist, but he’s also an author and philanthropist, bringing awareness, funding and care to many foundations and issues. Sir was also honored by the Mayor of Chicago for his contribution to HIV/AIDS awareness. After over 10 million streams to-date, hitting some of the largest stages in the world and a debut album, Sir the Baptist is on a life-journey and knows that there is so much more work to be done.